26 Sep 2017 / 11:50 H.
THIS sequel to the Kingsman: The Secret Service (based on the comicbook series) veers in several directions, but the last half hour when things come together, more than makes up for the wait. The movie begins with our hero Eggsy (Egerton) almost getting kidnapped by former Kingsman candidate-turned-nemesis Charlie (Edward Holcroft) and his goons. After a long-winded car chase and fight on the streets of London, Eggsy manages to get rid of all of them and heads for dinner with his love, Princess Tilde (Hanna Alström). However, all the Kingsman agents except for Eggsy and Merlin (Mark Strong) are killed in a series of missile attacks, and the two are forced to travel to Kentucky to find the Kingsman's US counterpart known as the Statesman. Led by Champagne (Jeff Bridges), the Statesman agents include tech support Ginger Ale (Halle Berry), Tequila (Channing Tatum), and Whiskey (Pedro Pascal). It is at the Statesman headquarters that Eggsy discover that his mentor, Harry Hart (Firth), is still alive but has problems remembering his past life. Getting Harry to remember who he is takes up too much time which drags the pace of the film down a bit. As for the main villain, we have Poppy Adams (Moore), a perky criminal mastermind with a nasty streak: she puts enemies into a meat grinder and serves them up as burgers. Through her organisation, the Golden Circle, she has taken over the global drug trade and intends to make the world legalise the drug trade. Her plans involve contaminating the drugs she distributes, making the user break out in a blue rash, then turn insane, before dying a horrible death. Tequila ends up one of her victims and as the team rush to find the antidote, they realise there is a mole among them. The movie could have done away with quite a few scenes in order to keep us riveted. Those include the one involving Elton John (who can't act at all) who is Poppy's prisoner. 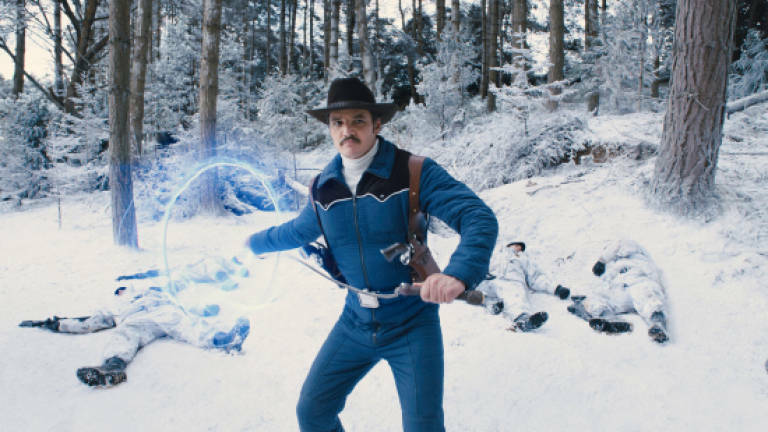 Banking in on his memorable battle scene in the Game of Thrones as the Red Viper, Pedro Pascal has a fantastic fight scene involving a lasso and a whip. There is even a homage to the late John Denver courtesy of Merlin. However as I said, the movie veers in several directions, and it took a while to remind us why we liked the first film so much.